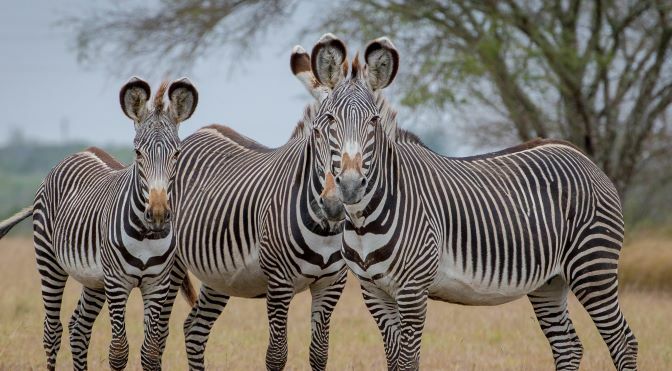 The Grevy’s zebra (Equus grevyi), also known as the imperial zebra, is the largest living wild equid and the largest and most threatened of the three species of zebra, the other two being the plains zebra and the mountain zebra. Named after Jules Grévy, it is the sole extant member of the subgenus Dolichohippus. Grevy’s zebra is found in Kenya and Ethiopia. Compared with other zebras, it is tall, has large ears, and its stripes are narrower. The Grevy’s zebra lives in semi-arid grasslands where it feeds on grasses, legumes, and browse; it can survive up to five days without water. It differs from the other zebra species in that it does not live in harems and has few long-lasting social bonds. Male territoriality and mother–foal relationships form the basis of the social system of the Grevy’s zebra. This zebra is considered to be endangered. Its population has declined from 15,000 to 3,000 since the 1970s. However, as of 2008, the population is stable but it is estimated there are only 2,000 left in the world.